The vegetable or fruit, or combinations of either, to be saved for winter. Getting the product ready for canning. This may vary with the different products from merely washing to peeling, removing seeds or pits, cutting up into sections, or any other work that may be required before getting the product into the shape into which it will be wanted for keeping. One of the objections sometimes made to the economy of canning is the amount of work and time required for this work. It should be remembered, however, that for fresh vegetables or fruits bought at the store as they are wanted, this work will have to be done anyway, in getting them ready to cook. It is really less work to do it in a wholesale way at the time of canning. The cans, jars, crocks or other Vessels in which the product is to be kept. There are a great Variety of these, which are described more in detail in Chapter 8, on equipment and accessories. 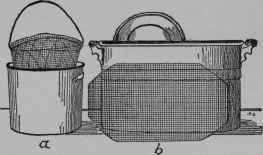 "Scalding or blanching" consists in dipping the product into boiling water or placing it in live steam for a short period-one to fifty minutes, where greens or green vegetables are to be put up, using steam gives the best result, as the volatile oils which they contain, and which would be lost by parboiling, are kept in the product. For blanching in hot water, the product is merely put in a piece of cheesecloth, left in the boiling water for the required length of time, and lifted out. For blanching in steam, the product may be put into a colander and placed over boiling water and covered as well as possible; but a steam cooker will be much more thorough and convenient. This consists in plunging the product, for a moment, into cold water after removing it from the boiling water or steam in which it has blanched. The colder the water for this purpose the better. The product after being dipped is ready to be placed in the container in which it is to be kept. The product should have been cut or prepared in such a way as to fit most conveniently into the container, unless it is to be put up whole. Syrup is made usually of water and sugar for pouring over the fruit or vegetables after they have been packed, before sterilizing. It is usually designated as thin, medium, or heavy, according to the amount of sugar it contains. For directions for making and testing syrup see page 76. With most vegetables, salt instead of sugar is used, generally only in small quantities-not much more than would be employed in cooking fresh vegetables. The too free use of salt very much injures the flavor of the product, and it should be applied only with care. For directions for making and testing brine of various strength see page 77. This is the application of heat which is counted on to destroy the germs and spores contained in the product, thus leaving it sterilized and ready to keep. The amount of heat and the time required will depend upon the product and the apparatus to be used. The different kinds of equipment for processing will be found in Chapter 8, on equipment. Fig. 3 - a - Wire pail to set in pot or kettle. b - Wire false bottom to go in an ordinary wash-boiler to prevent jars from cracking. A wooden false bottom may be made of laths to use in place of the wire bottom. After sterilization, the containers, if crockery or glass, will have to be filled immediately, while the contents are still hot, to keep the contents sterile, where cans are used, they are sealed before the processing. Where glass containers are used after being filled, they are inverted and left to cool; they should be examined carefully for any sign of leakage and not stored until one is certain that all covers are absolutely air-tight. Where glass containers are used the action of the sun or even of strong light will, with most products, gradually effect a bleaching out or discoloration. This is prevented either by storing the jars in an absolutely dark place, or wrapping each in newspaper or wrapping-paper to protect the contents from the light.